The contract, while better, still includes layoffs of both mechanics and clerks. The thousands who will lose jobs are likely not soothed by the news of the multi-million dollar bonuses execs will receive even if they only half-succeed transforming the carrier. 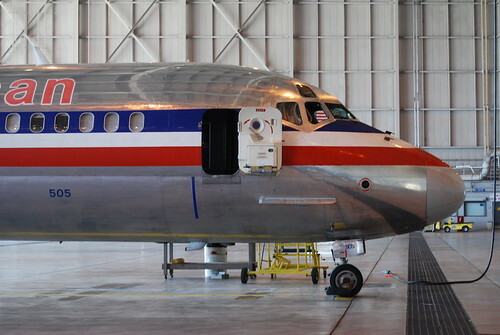 American Airlines plane in a repair hangar. Photo by Bill Abbott. Tentative agreements with American Airlines’ mechanics and store clerks don’t save any additional jobs but offer members immediate raises and less expensive healthcare compared with what the airline offered in May, union officials said Wednesday. Contract details are being shared with union members this week in advance of ratification votes. Transport Workers Union leaders say improvements to the proposed contracts are worth about $50 million. “It is an ugly agreement, but there are enough improvements that the negotiating committee felt it was necessary for the members to vote on this, and we’re trying to currently put together information to put out to the membership so they can make an informed decision,” said John Hewitt, Local 514 chairman of maintenance in Tulsa. Raises for workers, effective on the date of signing. For the mechanics, the proposal includes a 3 percent raise immediately, 3 percent in each of the next three years, and 1.5 percent in the final two years. Store clerks would receive a 3.5 percent raise immediately and then 2 percent raises in the next two years, 1.5 percent in the following two years, and none in the last year. A 401(k) match based on annual earnings, not a worker’s base salary. A smaller employee contribution to the healthcare premium than previously offered. The union negotiating committee voted 9-7 to send the proposals to its members for a vote. In May, the mechanics rejected a tentative agreement, 5,307 to 4,179. The store clerks’ vote was 521-495. Compared with term sheets filed with the bankruptcy court, the proposed agreements cut 1,800 fewer mechanic jobs than originally proposed by the company and 60 fewer store clerks positions. Those numbers are the same as offered in May. Under the tentative agreement, 2,400 mechanics — including those at the Alliance Fort Worth maintenance facility — will be laid off, as well as 215 store clerks, American said. Some local union leaders are encouraging their members to vote against the latest proposal because they say it is not significantly different from what was rejected in May. The union expects to announce voting results around Aug. 8, before the bankruptcy judge rules on American’s request to terminate existing contracts and implement concessionary agreements. American’s pilots are also voting on proposed new contract terms. Flight attendants are still negotiating. The deals were reached after American’s unions threw their support behind a potential takeover bid by US Airways. US Airways CEO Doug Parker said Wednesday that he hasn’t yet heard from American management after the Fort Worth-based carrier’s announcement Tuesday that it will consider possible merger partners. In an editorial board meeting with USA Today, Parker said he’s frustrated that he has been unable to talk to American or its creditors about a merger. He added that American parent AMR Corp.’s latest move in bankruptcy is a positive development. “I think you can color us skeptical right now about their true intention. Everything they’ve said and done up to this point seems to indicate that they want to emerge stand-alone. And, if they don’t want to emerge stand-alone, they want to go find some way to emerge where they’re in control. That’s what their actions have shown,” Parker told USA Today. American is considering five merger options and discussed the possibilities with the unsecured creditors committee Tuesday. The airlines that American is said to be considering are US Airways, JetBlue Airways, Alaska Airlines, Virgin America and Frontier Airlines. Wall Street analyst Ray Neidl at Maxim Group said JetBlue could help American improve its market share on the East Coast but that a merger between the two would be “a disaster” since their operating models are different. “We do not believe a merger of JetBlue and AMR is an economical option. Ditto for a merger of AMR and Alaska Air,” Neidl wrote in an investor note Wednesday.